When I put the kids to bed last night, the sun was shining bright, the birds were singing and they were being obnoxious and bouncing off the walls. A typical spring evening. We said our evening prayers and they were reminded to be thankful for all their blessings, their house, food, toys...all the things they had complained about at one point or another that day. I set myself up with the laptop for the night and watched as a rather dark and scary shelf cloud marched it's way across my sky. My anxiety started growing as I read about tornadoes just 30 miles north of me and I was home alone with my babies, my husband out golfing. Than I was sitting in my own little bubble of worry I get an email to the writers of Bigger Picture Blogs, "Sarah are you okay?" 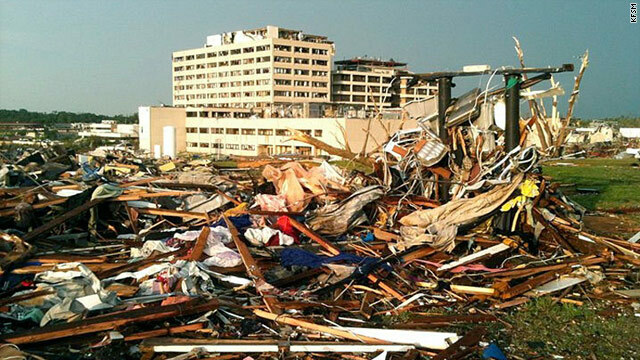 My heart sank as I learned that Sarah's small town of Joplin was devastated by a tornado. According to reports 1,000 people injured, 89 dead, hundreds of homes destroyed. Thankfully Sarah's family was spared and is all right. Other members of her family and friends are not, homes were lost, lives broken. The Bigger Picture Blogs Community is heartbroken for Sarah and her town. Joplin has been literally split in two by the devastation. We want to help, we NEED to help. With amazing speed and generosity from the blogging and handmade communities Bigger Picture Blogs will be hosting an auction to raise funds for the Salvation Army to aid in relief efforts in Joplin. Details will be posted later today or tomorrow. In the meantime can you help us spread the word? Will you blog about this? Put our button on your site? Donate an item? If you can do nothing else, please say a pray. A pray for Sarah and her family, for the town of Joplin and for all those families that are suffering. 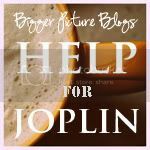 My sister and I were raised in Springfield, MO about an hour from Joplin and have many friends and family in the area still. The girls at the picket fence will help in anyway we can! We will share this right now with our facebook page. Hi Melissa! I am Biren from SITS class Group 50. Glad to hear you are okay. I have shared your post on Facebook. Will be thinking of Sarah and all those affected in Joplin. So heartbreaking...I am keeping them all in my prayers. I'll be helping spread the word via Facebook and my blog...and help in any way that I can. I am now following your awesome blog so I can keep up to date with the efforts made. The groups from Alabama are sending 2 trucks up to Joplin with donations. The Clemments family in Joplin helped us when we needed it and now we are returning the favor. My thoughts and prayers are with the community during this horrible time. Placing the button on my blog,The Empty Nest, and making a donation to my Salvation Army. Thanks for sharing this and many cyber hugs and prayers being sent to Joplin.